Dairygold today announced financial results for 2018 with annual turnover rising by €27.4 million to a record €992.9 million (2017: €965.5 million). The extreme weather conditions experienced in 2018 had a severe impact at farm level. As a Co-Operative, Dairygold responded by supporting milk and grain prices and introducing a range of farmer supports for farmers. Dairygold supported farm gate milk prices by in excess of €15 million above market returns, while delivering an operating profit of €28.9 million, a reduction of €3.5 million on the 2017 performance. Despite the challenging weather conditions Dairygold’s 2,850 Milk Suppliers expanded milk production by 2.7% during 2018 to deliver a record 1.34 billion litres of milk to the Society over the year. 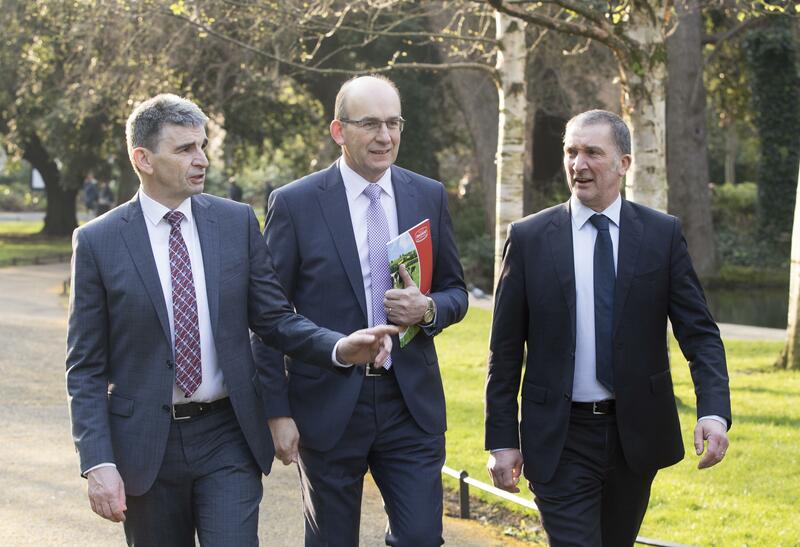 Dairygold, in line with its commitment to process all its Members’ milk, continued its capital programme and in 2018 committed a further €130 million as part of the Phase II Post Quota Primary Processing Investment Programme. Dairygold delivered an EBITDA of €48.6 million (2017: €52.8 million). At year end, the net asset value of the business was €337.9 million (2017: €335.5 million) and net bank debt stood at €111.4 million, a modest level given the scale of the organisation and level of profitability. Since 2009 and primarily as a result of the deregulation of the milk quota regime, Dairygold has seen its milk volumes grow by circa 500 million litres, a 60% increase, with milk solids (protein and butter fat content) increasing by 70% over the same period. Dairygold Milk Suppliers are projected to increase their annual milk production volume to circa 1.65 billion litres by 2023. In 2018, the Society committed a further investment of €130 million to ensure it continues to process all its Members’ milk. This investment is across three significant projects in County Cork. These comprise of; the establishment of a new cheese manufacturing facility in Mogeely, in partnership with TINE SA of Norway; increasing the demineralised whey ingredients capacity at the Castlefarm Dairy Complex in Mitchelstown and the installation of another evaporation and drying system at the Nutritionals Campus in Mallow. All three projects are scheduled to be operational by 2020. Dairygold will have invested over €300 million between Phase I and Phase II Primary Processing, between 2012 and 2020, to support the growth in milk production across its catchment area in Munster. In addition, Dairygold’s strategic partners will have invested a further €120 million in processing capacity on its production facilities. A future consideration for the next phase of primary processing investment has to be the funding model and how it is financed, by the Society and/or the Members whose ambition is for further growth in milk production at farm level. Global dairy market returns in 2018 were weaker than in 2017, driven by protein returns, which was reflected in the Society’s average milk price of 36.1 cent per litre, based on average milk solids. Looking to milk price for 2019, the prospects, as usual, are heavily dependent on the balance between supply and demand. 2018 global milk supply slowed significantly in H2, EU intervention SMP cleared in early 2019 and while NZ production volumes are expected to be positive for the season, Australia is negative and other large producing regions like the EU and US are neutral to slightly positive for H1 of 2019, meaning pricing upside will be dependent on stronger demand. Brexit uncertainty is overshadowing the market, especially cheese, creating negative sentiment in international dairy markets. The futures markets for dairy ingredients suggest that there is relative stability expected by buyers and sellers for the balance of the calendar year. Agri Business turnover was €261.6 million, an increase of 19%, driven by higher feed sales volumes resulting from unsuitable grazing weather and the consequent shortage of fodder, from spring right through the summer, while retail sales also increased year-on-year. In addition, to support its tillage farmers due to the extreme weather events, Dairygold’s grain prices for the 2018 harvest were circa 40% higher than 2017 and the highest paid by Dairygold since 2012. Dairygold continued to progress its €11.5 million Store Investment Plan designed to establish a modern fit for purpose Agri store network. Five new store builds commenced in 2018 along with eleven store upgrades. Dairygold is very focussed on sustainability and has introduced a number of significant initiatives, including leading the way with the introduction of a new milk bonus payment for more sustainable milk production practices, the introduction of Leanfarm and the continuation of the Dairygold – Teagasc Joint Programme. Dairygold is pleased to support and participate in a number of important national programmes including Origin Green, the Dairy Sustainability Framework and the Agricultural Sustainability and Support Advisory Programme. In addition, our customers and global markets have raised the bar on transparency, accountability and traceability. All Dairygold Milk Suppliers are participating in and compliant with Bord Bia’s Sustainable Dairy Assurance Scheme (SDAS). To ensure the Dairy sector realises its ambition for growth, it must positively influence the sustainability agenda. This requires clarity and a clear pathway to address the environmental challenges. The industry has to act now, through a focussed and coordinated national strategy, with a clear template being provided to the farming community to achieve sustainable growth. Ireland needs a Brexit deal that is as similar as possible to the existing trade arrangements within the EU. Even if a comprehensive Free Trade Agreement is negotiated and agreed, it will not be comparable to EU Single Market membership due to additional administration burdens, health and veterinary certification, customs procedures, transport and logistics delays, supply chain adjustments, potential regulatory divergence and competitor pressures. No level of planning could insulate any EU organisation, trading with or through the UK, against the implications and consequences of a hard or no deal Brexit. That is why it is critical, no matter what the final outcome of the negotiations, that there is a sufficient transition period, to fully prepare for the future trading relationship between the EU and UK. Even then, the Dairy Industry will suffer serious consequences in the event significant tariffs applying. While Dairygold has committed to process all the milk supplied by its Members and has invested to underpin this commitment, there is also a significant ambition in the Society to increase the proportion of higher margin ingredients produced by it. In particular, Dairygold has a strategy to respond to market trends in life-stage nutrition by developing products that meet the ever-changing needs in both developed and developing countries. This strategy encompasses both powders and cheeses as consumers recognise the unique properties of dairy-based nutrition and respond by consuming readily accessible products. The value-added higher margin ambition will be realised by leveraging the investments made since the start of the post-quota investment phase of expansion, where a conscious decision was made to future-proof the processing capability of the facilities. It will also be realised through further investment where appropriate, either in the existing facilities or through the acquisition of businesses, that progress the value-added journey. Dairygold has significant existing operational and commercial capability and is supplying some of the biggest global nutrition companies with high-quality ingredients. It is from this solid foundation that the strategy will be delivered. Please click here to view Dairygold’s full Annual Report and Financial Statements 2018.